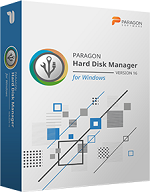 Description: Paragon Software Group, a recognized data storage expert, releases Paragon Hard Disk Manager 17, the all-inclusive data management tool, now with a new user interface, advanced partitioning, and disk clone functionality. Hard Disk Manager 17 encompasses four indispensable system management tools: Backup & Recovery, Partition Manager, Drive Copy, and Disk Wiper, all of which are easily accessible from a single UI. The 17th edition introduces a new disk clone functionality which enables PC users to create an exact, uncompressed replica of a system hard drive on another drive, saving migration time and effort while allowing for greater OS portability. On top of this new functionality, the user interface has been fully redesigned to deliver a smoother experience thanks to the revamped look and feel. Paragon Hard Disk Manager 17 embraces a new color scheme, intuitive controls, and comprehensive improvements for users.